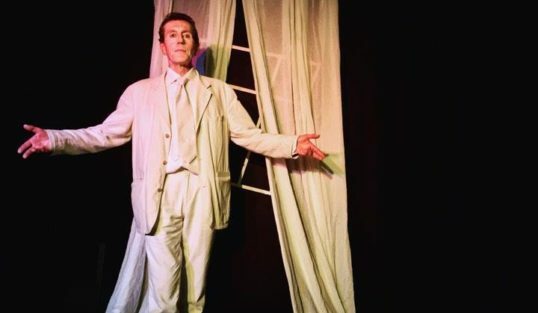 Intelligent, driven and ridiculously entertaining, Michael Daviot’s historical one-man-show 1917: A Phantasmagoria is as close to the ideal Fringe show as you could imagine. If you were to draw up a checklist of what a memorable Fringe production should be like, this would fulfil so many of the criteria. Michael Daviot in 1917: A Phantasmagoria. Pic: Graham Fennell. There should probably be an intriguing, entertaining, thought-provoking script – maybe one that casts new light on historical events. Daviot certainly provides that, in a brilliantly put together whistle-stop tour of a century ago. As you might imagine, Passchendaele and the ‘storming of the Winter Palace’ appear, but not necessarily so prominently, or in the ways you might imagine. There is also an understandable emphasis on artistic events, but not to the exclusion of other strands of the human experience. You would also want a top-class performance. That is undoubtedly what happens here – this is a masterclass in acting, with different personas taken up and shaken off at will, at a speed that seems natural at the time but is dizzying in retrospect. Some are accurate impersonations, some are more expansive approximations, some are discharged with a puckish relish, but all are quite wonderful. There is a superb W.B.Yeats, a Sherlock Holmes that is so right you could happily see hours more of it, not to mention some lipsynching to George Formby Senior and Harry Lauder that comes as close as anything to harnessing the ghosts of the past. Most strikingly, there is a depiction of a Tennessee lynching that is – quite rightly – almost unbearable, and features a simple but thoroughly effective piece of theatrical business. Which brings us to the next item on our checklist – use of resources. A small screened-off room in an identikit Holyrood hotel that gives little sign outside that it is participating in the Fringe at all, proves to be more than adequate, if somewhat compact and bijou. In it, magic is created by Daviot and director Mark Kydd with a couple of simple props and oodles of theatrical knowhow. The staging, like the acting and the writing, wears its craft lightly, all the better to draw you in. The whole thing is structured so that you feel you were being told more about things you knew, but had somehow forgotten – even though you never knew anything about them to begin with. Parallels with modern-day events, with militarism, oppression and prejudice, are there to be drawn without being hammered home. The use of Gustav Meyrink’s Walpurgisnacht as a spine for the story gives it added shape and only adds to the feeling of spirits being conjured up. 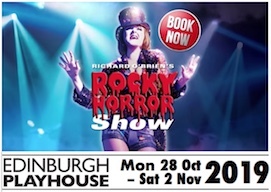 In a much-trumpeted anniversary year, if you want to see a show that distills the essence of the Fringe most effectively, it should probably be this.